The list of things I've never seen before has just been reduced by one. 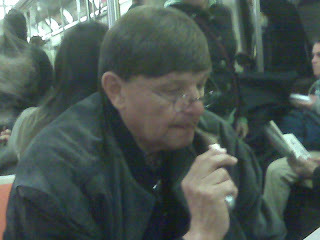 This afternoon I saw a man eating a cigar on the subway (of course). It's hard to tell from this picture, but this man is eating a cigar. It was really gross, and this is coming from the man who takes pictures of barf and dead animals. I really think you enjoyed this. I am not certain of why you are watching the eating habits of those on the subway. Perhaps you should have asked him for one? What is wrong with my cat?